It’s not unusual to meet a bi-vocational minister. Even the Apostle Paul made tents on the side! So it doesn’t surprise many people to learn that in addition to serving as Lead Pastor at Christian Challenge, I also have a second job. But sometimes my choice of second profession does raise a few eyebrows… and a few questions! I serve as both a pastor AND a politician – an elected official representing Pineville’s District 5 on the City Council. In some circles, “politician” is considered a dirty word. And to be fair, in other circles, “pastor” can have some pretty negative connotations as well! Politics and religion can both be polarizing and controversial in their own right, and often they appear to be at odds with each other. Some say I’m foolish to even try to integrate these two apparently incompatible worlds. But for me, there is no conflict. I may have multiple jobs, but I only have one calling: to love God and love others. (See my June 4, 2016 "guest sermon" in the Town Talk for more on this.) My roles in ministry and politics both provide me with different avenues to live out that call. It all boils down to relationship. As a pastor, my primary interest is in seeing individuals reconciled with God, to see that relationship brought to a healthy place. But a pastor is also often called upon to help individuals reconcile with each other. It might be a family issue between parents and children, or a marriage issue - but I consider it a very high honor when people trust me to help them navigate difficult personal situations. In a similar way, as a councilman, I have the opportunity to act as a mediator for my constituents when they feel like they’re not being heard. Sometimes it’s a conflict between neighbors where I’m able to step in as a third party and help both sides come to an agreement. Sometimes it’s an issue one of my constituents is having with drainage or traffic or something else where they’re seeking intervention from the City. I might not be able to solve their problem, but many times I can help them better understand the process and why things might be taking longer than they’d like. I’m honored that for four terms now, the residents of my district have trusted me enough to choose me as their representative. But it doesn’t stop there. Because I serve as a councilman, I’ve also had the opportunity to build relationships with other elected officials, and sometimes they seek me out not as a fellow politician… but as a pastor. Because we’ve built relationships through working together on governmental matters, and because they’ve seen my heart and know as a pastor I carry secrets to the grave, many of them have reached out in difficult times to ask for prayer and have shared their own secret struggles in hopes I might be able to shed some spiritual insight into their journey. So in a way that only God could orchestrate, my two seemingly disconnected career choices come together in harmony. And that’s why I love serving in politics! But I can still understand why many believers find politics distasteful. Aside from the history of corruption, politics involves controversy, and controversy is uncomfortable. It’s human nature to avoid things that are unpleasant. For Christians, avoiding politics can feel like not only the more pleasant route, but the more noble or spiritual one as well. So maybe there are some conversations we try to avoid. Maybe we retreat to “safe places” where everyone agrees with us. Or maybe we just throw up our hands in frustration and try to ignore it, to disengage from the process entirely. I’d like to challenge you to get out of that comfort zone. As believers, I think we need to be a little more comfortable with being uncomfortable. We will be asked where we stand on certain issues, and our positions won’t always match popular opinion. That’s OK. Rather than retreat, we should be prepared to share our beliefs with confidence and humility, while leaving room for others to hold different yet equally strong convictions. The Bible offers several examples of believers who were also active in government. Some even served in pagan, Godless governments - and yet thrived because of their faith compass. Take Joseph for example - his integrity and willingness to speak truth to power brought him into the #2 position in the entire nation of Egypt. He not only saved the Messianic line of Abraham, Isaac and Jacob from the coming drought, he also saved the nation of Egypt and countless others by his wise political dealings and insightful policy decisions. There are many other examples of believers who served in political or governmental office, including Nehemiah, David (and all the kings), Esther, Mordechai, among others, and in Paul’s day there were even believing members of Caesar’s household, which could refer to those employed in service of Nero (Phil 4:22). Also, Erastus, the city treasurer of Rome was a strong believer who supported Paul in his ministry (Rom 16:23). What’s interesting is that many of the examples I cited served in “non-believing” governments. They were in the minority party, so to speak. And yet, they were able to accomplish much good while remaining true to their faith. They didn’t approach governmental service as a top-down mindset where they legislated morality, but rather a bottom-up perspective that focused on serving and taking advantage of the opportunities before them to advance the Kingdom of God. My experience with politics is that it is largely the art of relationships, negotiation and shared consensus. There is always room for disagreement, but when the greater good is kept as the focus, positive compromises are reached. There are many areas in which I disagree with the people with whom I serve, but when we focus on the things we agree on, we’re able to make our community a better place. Certainly politics always attracts a few self-centered ego-minded individuals who are in it for themselves. But MOST of the people I’ve met in local politics have a genuine desire to serve the community and make this a better place. And when we care about the people we’re serving more than we care about winning an argument, people who disagree can still accomplish much good together! I’ve discovered that this room for disagreement applies to much more than the political realm. For over 25 years now, I’ve been a part of a weekly gathering of pastors from varying backgrounds: Assembly of God, Baptist, Church of Christ, Lutheran, Methodist, Nazarene, Pentecostal, Non-denominational, etc … and we certainly don’t agree on every area of theology! But we can have amazing (and often challenging) conversations because we value each other enough to look past our differences and focus on our common goals. Whether it's religion or politics, if all of your friends think like you, talk like you, and believe like you… then who are you influencing? You may be comfortable, but you also may be missing out on experiences, relationships and opportunities that God has for you. Remember, Jesus said we are the salt of the earth and the light of the world. (Matt 5:13-14) So step out of that comfort zone. Do it with love and humility, do it not just with a desire to be heard, but also to hear others… you just might be surprised by what God can do in you and through you! My challenge is not to be afraid of politics or religion! Look for the opportunities to agree, and don’t be so insecure that you can’t listen to someone you disagree with. It’s the tension on the string that makes the guitar produce beautiful music. And you might just find that the person you’re disagreeing with is also motivated by love and a desire to serve. And that can lead to a mutual respect and understanding, and even appreciation for those with whom you disagree. Children’s Ministry is a vital part of EVERY church’s life, and I am so grateful for the members of Christian Challenge who serve God by working with our kids on a regular basis. As they will gladly tell you, it can be a very rewarding experience! It can be fun and exciting and uplifting… but it can also be frustrating. Children’s Ministry is not easy. The work itself can be challenging. Children today are used to spending their time with screens. Take away that digital babysitter and they can get bored very easily. They don’t always want to listen to an adult. Or sit still. Or be quiet. Or participate in group activities. They are growing up in a culture that is increasingly less friendly towards people of faith. And then once or twice a week (if even that often), for a very short period of time, our Children’s Ministry workers have an opportunity to let these children know that God is real, that He loves them, and He wants to have a relationship with them. Common misconceptions of what Children’s Ministry is can add to this difficulty. Some adults who might not have served in Children’s Ministry may see it as little more than free babysitting. Maybe they don’t even think it’s necessary because they grew up in a church where the children stayed with the adults in the main service. On the flip side, others may see it as a necessary but burdensome sacrifice that a few brave souls make so that the rest of the adults don’t have to deal with the distraction of children during the sermon. Some people don’t volunteer to work with kids because they don’t feel like they’re qualified or can relate to children. Others don’t volunteer because they feel like they’ll miss out on the “real” teaching in the adult services. Children’s Ministry may not be your primary calling, and that’s OK! But even if you never set foot inside a kids’ church classroom (though I hope you do! ), you need to understand that Children’s Ministry IS MINISTRY. It’s as much a ministry as what I do when I bring the sermon on Sunday morning. The Gospel is still the Gospel whether it’s taught using words that a 5-year-old can comprehend or preached in the most eloquent of terms. Children’s Ministry does provide a safe place for children, but it’s not a babysitting service. It does provide an alternative teaching experience geared towards younger minds, but its purpose is not to remove a potential distraction from the older minds in the sanctuary. The purpose of Children’s Ministry at Christian Challenge is the same as the purpose of Christian Challenge: We make disciples. The main difference is that the disciples we make in Children’s Ministry are a little bit shorter and a lot more energetic! I never thought I would be involved in children’s ministry. To be honest, I had many of the misconceptions that I mentioned earlier. And children’s ministry seemed … well, boring! And slightly intimidating. Then I got invited to lead chapel at Grace Christian School on a regular basis. Because my children were going to Grace, we would get an extra discount if I led the chapel, so I accepted with some reservations. I had no idea that I would fall in love with leading worship and communicating essential truths of Christianity on a lower-elementary level. Although my children’ haven’t attended Grace in many years, I’m still there every week singing “Bullfrogs and Butterflies” and other fun songs, and attempting to share the Gospel in a way that Pre-Kers and their grandparents in attendance can connect with. What a rush! Another thing that happened around the same time was we started making regular visits to the Benito Juarez Children’s Home in Reynosa, Mexico. I had visited there off and on previously but that same year something clicked and we started making multiple trips a year. And I fell in love with the children. Now they are family, and although the children we first started visiting in 2003 are mostly grown and gone, visiting the children’s home is a significant part of our regular ministry at Christian Challenge and something I personally get much pleasure out of. I guess you could call me an ACCIDENTAL CHILDREN'S MINISTER! I didn’t intend to ever do Children’s Ministry - and now I find myself looking forward to the opportunities to call the children up on the platform at church during special services to do a “children’s sermon” or connecting with them as I share the Bible lessons at Vacation Bible School/Camp, or just MC our Fall Family Festival and other children’s activities. While I never thought of myself as a “children’s minister” per se, it has certainly become of the highlights of ministry - and the connection I get with the children is life-lasting. I’m not the only one who’s had that “accidental children’s minister” experience. Jenni Baier, who organizes our Vacation Bible Camp and is the driving force behind our Fall Family Festival, never saw herself working with children either. She was afraid that she wouldn’t know how to relate to young kids and wouldn’t know what to even say to them. Then in 2009, she went with us to the Benito Juarez Children's Home and experienced Children’s Ministry in a whole new way. For the first time, she saw that you could minister to kids effectively even if you can’t speak their language very well. There was value in just being there and just loving on them. Jenni began to see Children’s Ministry as an opportunity to invest in children and their future and has been hooked ever since! Last year, she suggested that we try a new approach to VBS - a Vacation Bible CAMP with multiple activities such as dance, art, sports, etc. It wound up being a success, engaging children and volunteers on a whole new level. 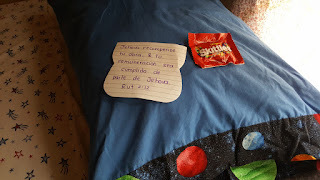 This past week I was leading another trip to the Benito Juarez Children's Home in Reynosa, Mexico, and I hope you enjoyed the guest post from Debbie McBride. I deeply appreciate her vulnerability and willingness to share an authentic picture of the struggle many young mothers share, as well as her invitation to be a sounding board and support for moms going through similar circumstances. Based on the feedback I received, her guest post struck a nerve! 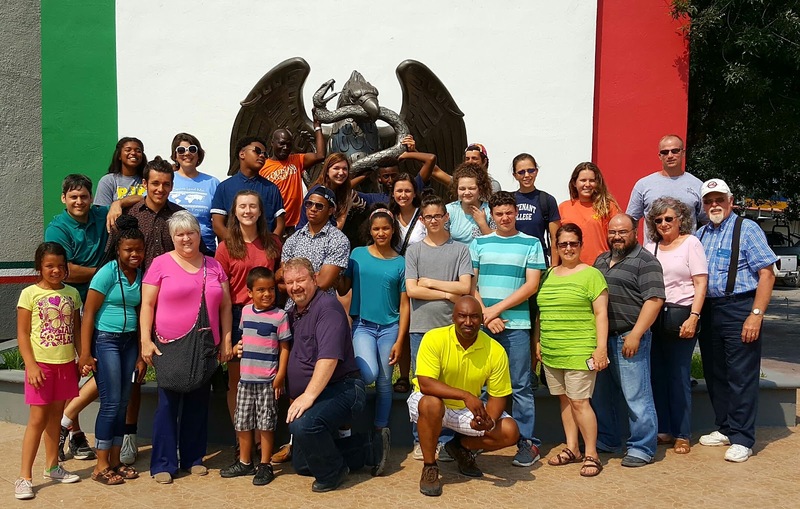 I wanted to use this week's post to share about our recent trip to the Benito Juarez Children's Home, founded in 1967 by Don & Opal Russell. (The were also the founders of the King's Way Missionary Institute in McAllen, TX, where I learned Spanish before being a missionary in southern Mexico from 1986-1990.) I first visited the orphanage in 1984 as a student at King's Way and volunteered some of my time there during the year and a half that I lived in McAllen. In the 1990's I took a few groups of our youth down to visit the orphanage, but in 2003 we started visiting and supporting on a regular basis. We have lost track of how many trips we've made to the orphanage since then, but it's been an integral part of our missions activity for the past decade plus. On Sunday, June 5, 29 people from 6 churches loaded into 3 vans for 1 purpose - to love and serve the children and staff of the Children's Home. 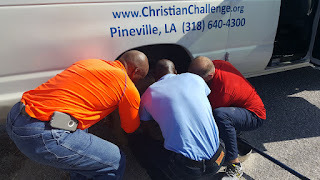 It wasn't long before we experienced what has become a routine occurrence for us on mission trips - a flat tire! And worse than that, it was one of our brand new tires, not even a week old! But with an amazing support team we got the spare on in no time and later discovered the problem was the valve stem, not the tire. God blessed us that we had caught it before the tire was completely deflated, so there was no damage to the tire. And back on the road again! 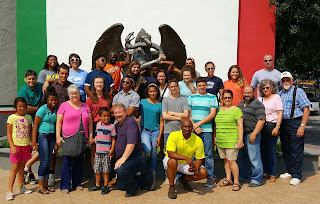 We spent the night in a hotel in Refugio, TX, and were in McAllen by noon for lunch with Mark Russell, son of the founders, who is the now the director of the children's home. After picking up a few last minute supplies, we made an uneventful border crossing and made our way down the quickly deteriorating roads to our destination. (Most heard comment: "And I thought LOUISIANA had bad roads!") The children were in school but quickly piled out of the current school building to welcome us with hugs and excited laughter! What a reunion! 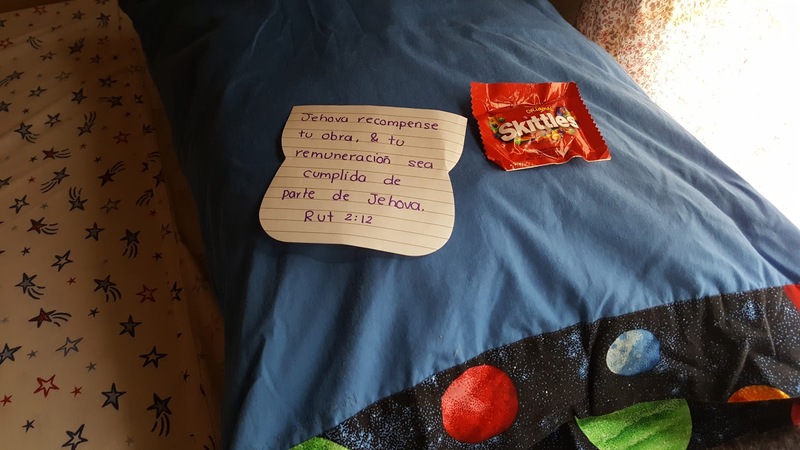 They had also prepared something special for us - on every bed was a small bag of candy and a hand-written Bible verse in Spanish that spoke of God rewarding our work. It was a beautiful gift that touched every member of the team. Normally the day we arrive is spent unpacking, settling in and playing with the children. 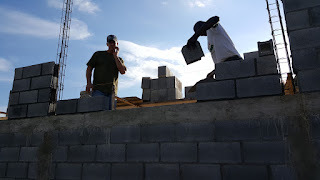 But we had several men on this trip who came ready to work, and within an hour of arriving, they were already on the site of the new school, assessing the needed work, and jumping right in to "get 'er done!" These next few pictures show some of the crew working to level the fill-dirt to prepare for concrete while others started laying blocks! Meanwhile, the youth had gathered up all the children and while some were playing games, others were worshiping in a circle outside the children's dorm. It was evident this was going to be a special trip! That afternoon we had an opportunity to do something new. 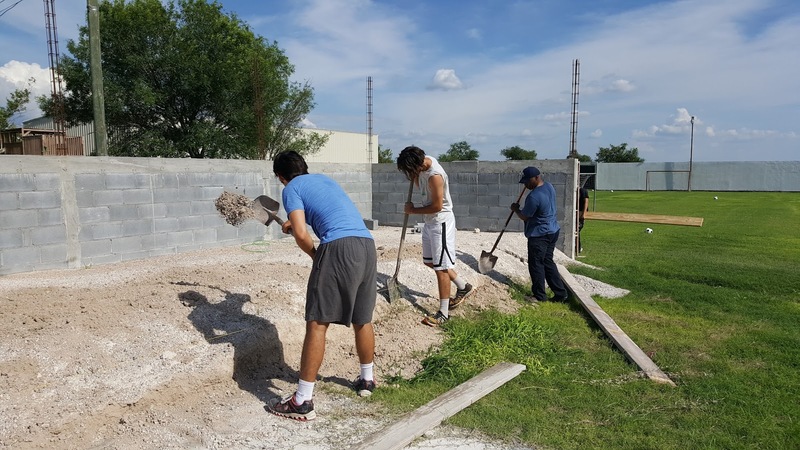 Due to recent violence in Reynosa, our teams have not ventured off campus for the last few years. But this year, with Mark's permission, we brought 200 Spanish New Testaments, donated by the Gideons, and passed them out door-to-door in the nearby neighborhood. We had several "God-moments" when we know the Lord had created divine appointments for us to share the Gospel and pass out His Word. The team did a terrific job! Just as we were finishing up with the Bibles a nice rain shower descended on us. It was refreshing but heavy enough that we took refuge in a convenience store and bought some cold drinks while the rain passed. 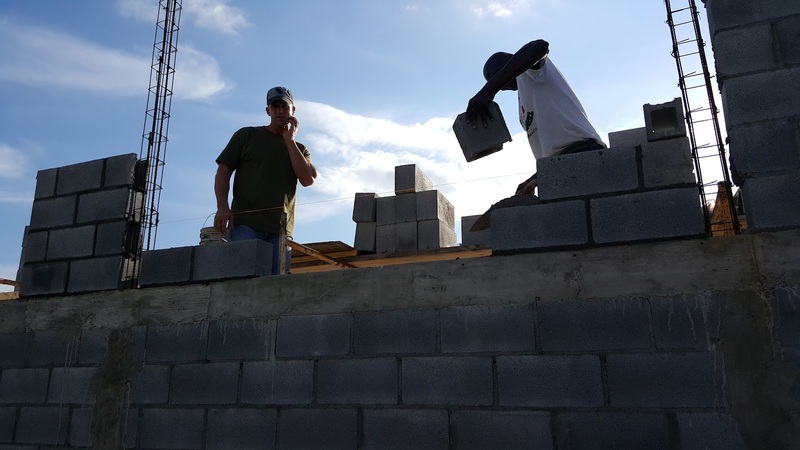 Back at the children's home, the workers saw the dark wall of rain approaching and just when they thought they would have to abandon the work, it stopped! It rained just enough to refresh them and the clouds blocked the beating rays of the sun, but they never had to stop working! Later that afternoon I took the church van to a mechanic to get the AC worked on and found that just half a mile away it had rained so much that the streets were flooded and cars were stalled out! 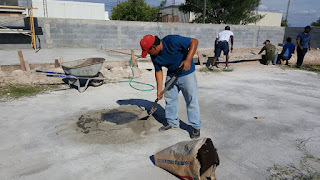 God had refreshed us with the rain but prevented it from stopping our work! Wednesday night was very special to our team. After another long day of working on the school, we knocked off early enough to get showers before supper and then retired to the chapel for our team devotion while the children had their after-supper bathing time. Darrell Carter from our team brought an amazing devotion entitled "How do you go through the fire when you keep requesting to get out of the flames." It was quite challenging and thought-provoking! 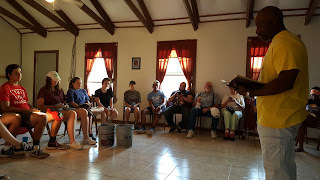 The Mexican workers at the children's home had asked to meet with us after our devotional time and to my surprise they announced that they wanted to wash our feet! They shared that on a previous trip, my wife had ministered to their ladies by giving them massages, including foot massages, and they wanted to minister to us by washing our feet. I was so broken as I sat there - all I could think is, "We should be washing YOUR feet! You are the heroes! We come down here a couple times a year but you are here day in and day out loving these children, serving them and showing them the way to Jesus!" 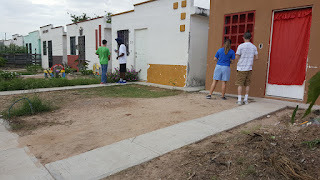 After they were finished and we had prayed and hugged and they left, our team stayed for another hour-and-a-half praying, confessing, sharing struggles, and interceding for our loved ones who don't know Jesus! It was a highlight of the trip! 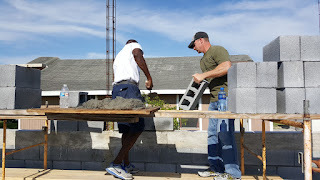 Thursday was our last workday and the team determined to finish the project they had started. 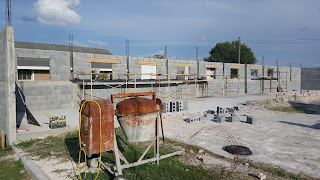 While some of our team continued working with the children, doing crafts and Bible lessons, the rest of the team worked hard to finish laying the block, build forms for the headers over the windows, build the metal cages that go in the forms to hold the concrete together, mix the concrete and finally pour it into the forms to create the header. 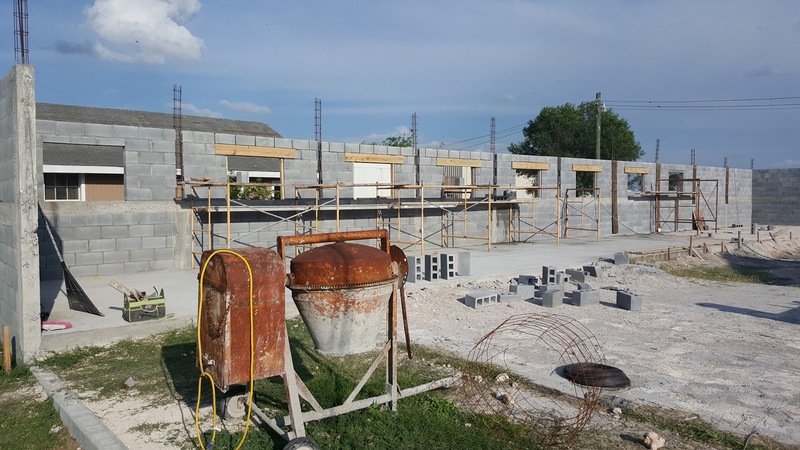 While earlier in the week it didn't look like we would get that far, that afternoon the final header was poured and just before supper the final block was laid! MISSION ACCOMPLISHED!!! The final night at the orphanage is always very special as the children typically have prepared "choreographies" (dances or "human videos") for us, and we have a very special time of sharing - and this trip was no different. After the choreographies, we gathered around a bonfire outside as Julio presented each person with a small piece of wood and encouraged us to, by faith, place our sin, our struggle, our doubts, our fears, etc onto that piece of wood and then toss it into the fire as an act of faith. It was a moving time, especially when Allison McCloud led us all in singing "We are the light of the world" in the light of the bonfire. Then we retreated back inside from the mosquitoes and had a time of sharing our goodbyes. This is the hardest time of the trip for me personally as I translate both for our team into Spanish and for the children and workers into English. The love that is shared is very real and there are very few dry eyes in the place. We arose EARLY Friday morning to pack the trailer, clean out the dorm and say goodbye to the brave souls to woke up before dawn to see us off. Then we headed to the border and met Mark for breakfast in Pharr, TX, before driving to Progreso, TX and leaving our vehicles stateside, walked across the bridge to do a little souvenir shopping. That night we made it as far as Houston and then back to Pineville the next day, tired, road-weary, but with very full hearts. I'm especially proud of this group and all the folks who went with us. This is the largest group I've ever led, and while it had its logistical challenges, the team members were wonderful and very flexible! We had 10 from Christian Challenge, 8 from Good Hope Baptist Church, 7 from New Life Community Church, 2 from Philadelphia Baptist Church and 1 each from Greater New Hope Baptist Church and River Outreach Center. And I'd take every single one of them back again in a heartbeat!!! I've posted more pictures on my Facebook page, along with some commentary. Please feel free to take a look at them to celebrate all God has done! Also, please pray for the workers and children at the Benito Juarez Children's Home in Reynosa. That's a very special place and the love of God is evident there. But that region is wracked by drug-war violence and turf battles between drug cartels, and the emotional strain is evident. The children's home has never been in direct danger, but the workers have occasionally been near shootouts or raids when they've traveled through parts of the city they don't allow us to visit. So keep them in your prayers. And pray about visiting them with us one day! Don't worry, we won't go anywhere near the "hot spots" - but we will go near the heart of God when we love the children in Jesus' name! When I relaunched my blog a few weeks ago I mentioned that from time to time I would have a guest blogger. This week, while I’m traveling with our Missions Team in Mexico, is a great time for me to try that concept out. I’m excited to share a guest post with you from Debbie McBride, my personal assistant and the Office Manager at Christian Challenge. She’s a mother of four, and though her children are in their teens and 20s now, she hasn’t forgotten what it was like to have young kids at home and how isolating that can be. Last week, I talked about how isolation can make us vulnerable to situations where others can take advantage of us. We all go through seasons that are difficult, lonely, and frustrating. But we live in a culture that values independence and self-reliance, so we don’t want to look weak in the eyes of others. Sometimes maybe we’re a bit too good at it. We work hard to hide our brokenness... and then wonder why no one notices that we’re hurting. On the flipside, we don’t want to insult others by implying that they are somehow broken. We don’t want to offend them with an unwanted offer of help. So we take their facades at face value and don’t reach out, even when we suspect something isn’t quite right. That’s not genuine relationship. That’s certainly not discipleship. I think we can do better. I was a mess. I had four small children in the span of eight years. Neither my family nor my husband’s family were available to help support me. We had one aging vehicle and lived in an older home that seemed to be falling apart a bit at a time. My husband worked 60-70 hours a week to try to take care of us. I was alone at home with the kids ALL.THE.TIME. My only escape was church on Sunday and the grocery store when I could get the car to make a trip, usually with all the kids in tow. I had no close friends and my marriage was strained. I was still coming to terms with a turbulent, troubled past and trying to figure out how this marriage and parenting thing was supposed to work. I desperately needed guidance and help but felt there was no one to turn to. Depression hit me like a ton of bricks and I had an emotional breakdown. I felt like a freak. Those who knew me didn't quite know what to do with me and those who didn't just pretended all was well. I don't want that to happen to the young mothers I see in our church. I want them to have help available. But, what does that look like? Often, we only see these moms for a couple of hours once a week. We don't know their struggles. We don't know much about them at all beyond their presence on Sunday morning. How do we older women reach out to the younger women who are in the middle of that season of life and help them? Younger women, how can we older women best help you? I understand you are hesitant to reach out and I don't want to get all up in your business and I don't want to invade your privacy or create an unhealthy relationship, but I do want to help. As an older mom, I've been there, done that, got the scars to prove it and I believe I have hard earned wisdom from my experiences to share that may make this season in your life more bearable. Younger women, do you want an older womans perspective? Are you willing to hear encouragement? I believe many older women want to be an encourager to our young mamas but don't know how to do it in practice. What are some ways that we can be of practical use to you? Older women, please keep in mind, our goal is to help our little sisters, therefore, do not be judgmental or a gossip. Keep their confidences close. Do your best to carefully consider the situation and their strengths and weaknesses before giving advice. I would have loved to have someone with experience to talk to, to vent to, to ask for ideas, to help me, to have an adult conversation with and to know that someone, anyone who could have seen I was at my wits end and gently steered me in the right direction. It took three years for me to recover from my breakdown. Three years lost. Three years taken from my family. I don't want that for the young mamas in my world. I see you corralling your kids. I see you're doing your best. I see how tired your are. I see your struggle to pretend all is well. Would you be willing to let someone in and help? If you are seeing yourself in these words and would like a listening ear and a tender heart toward where you are right now in life, I would love it if you reached out to me. I won't impose where I am not wanted, but if any of what you just read resonates with you, please just give me a call, send me a message, grab me after church, whatever works for you and I would love to get with you and start a friendship. I really appreciate Debbie being willing to share her story and her offer to help. We’re all in different places in our lives. Maybe you’re in a place where you can take Debbie up on her offer. If so, I hope you will. Or maybe you’d like to make a similar offer to others, and share from your experiences. No matter where we are in our journey, we should always be on the lookout for people we can reach out to. And in a perfect Christian community, we would also always have people in our lives who were reaching out to us. And that’s what discipleship is really about! I think sometimes we might be a bit put off by the word “discipleship” because it sounds so formal, so old-fashioned, so… religious. At Christian Challenge we talk a lot about discipleship because it’s one of our core values. We teach about it in our foundational class, the Disciple’s Heart. We believe that it is of the utmost importance, a sign of spiritual maturity. But perhaps in that process, we’ve inadvertently led you to believe that it takes more training, more knowledge, more experience than you have. Maybe it seems like such a lofty thing that you don’t feel worthy of offering it to others or even receiving it for yourself. Maybe you feel like you don’t have any strengths that are strong enough to be a help to anyone else. Maybe you feel like you should leave the “discipleship” to the pros. This week, I’d like to challenge every one of you to be a little vulnerable (but in a good way). Just like Debbie did in her guest post, I’d like you to think of a time in your past when you wished you had more support from your brothers and sisters in Christ. Ideally, you want to pick something that is far enough behind you that you’ve found some healing and can offer some of the perspective that only comes with distance. Or perhaps you can pick a time when you wish you had reached out to someone and didn’t because of whatever reason. Describe the situation, then offer to be there for someone who might be facing a similar situation. You may be wondering, what if I do this and no one responds to me? That’s a definite possibility. I’m asking you to take a risk. Because it will bless someone, even if you never know about it. And maybe, just maybe, someone will take you up on your offer. When I began to write this week’s post, I thought it would be a practical post about online safety and tips to avoid common scams. (I wasn’t thinking about identity theft but more about what is often referred to as “confidence games.” I’ll explain more on that later.) But I soon realized that this was the wrong place to focus - the scammers and “catfishers” aren’t the problem, they’re exploiting the problem. So I’d like to address what I feel is the real issue, and it’s more of a heart issue than a technical one. How do you decide who to trust? As Christians, we often want to believe the best about others, especially other Christians. Being someone who trusts easily is NOT a bad thing! The Bible talks about having child-like faith, and that includes an ability (and willingness) to trust both God and others. 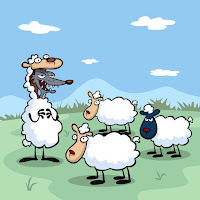 But the Bible also says, “Behold, I send you out as sheep in the midst of wolves; so be shrewd as serpents and innocent as doves.” (Matt 10:16, NASB) There needs to be a balance. One of the most basic levels of trust that we give to other human beings is the general acceptance that they are who they say they are. When we meet someone for the first time, we don’t demand three forms of ID and half a dozen letters of reference. When we get a friend request from someone on social media and we recognize their name, we generally accept that they are who they say they are. We take people at their word. For most of our everyday interactions, that’s all we really need. 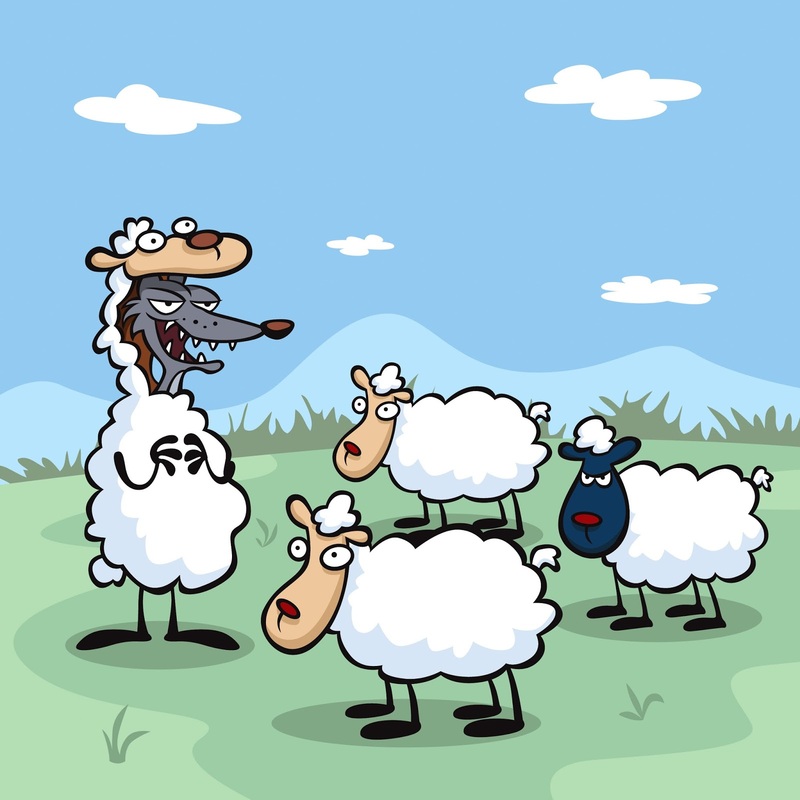 But we cannot forget that there are a lot of wolves out there, and many of them are in disguise. While their initial appearance doesn’t often give them away, their subsequent actions will. And that’s where the “confidence games” come in. Did you know that the “con” in “con man” or “con artist” is short for “confidence?” Confidence scammers, con men, con artists - they exploit trust. They might be targeting the trust that you have in someone else (because they’re pretending to be someone you know). They might try to build up your trust and then play on your emotional needs through an intense, staged relationship with you where they say all the right things and present themselves as everything you want them to be. (This has also been called “catfishing.”) Or they might play on our very human desire for financial gain with minimal effort (get rich quick scams). These are just three general categories of confidence tricks - there are many more, and every con artist custom-crafts his/her “game” to fit his/her victim. If you’re interested in reading more about confidence games, there’s a good list of them on Wikipedia. And this is where we need to be shrewd as serpents. It isn’t that difficult for a social network scammer to pretend to be someone you know. They just copy all of the public information that is available about the person they’re pretending to be and use it to create their own imposter profile. Scammers can also use your public profile information against you. They’ll look at what you post to see what’s important to you, and then they’ll present themselves as exactly the kind of person you’d want to get to know better. But getting you to accept a friend request or start a conversation is only part of the game they’re playing. Scammers are almost always after your money, but to get to your money, they need to convince you to send it to them. It’s easy to sit here, at a distance, removed from the “heat of the moment,” and tell you that if something seems too good to be true, it probably is. We all know that. But when someone presents just the right lure under the just the right conditions, we’re also willing to forget that! We’re willing to believe that it will be different for us - at least this time. And so we take the bait. In my role as Pastor, I’ve comforted and counseled many who have fallen for a con man’s game. And every single one of them, even as they made what turned out to be a very bad decision, honestly believed that it was a good choice. And I can relate. Last week in this blog, I confessed that I don’t always make the best decisions myself. As a Pastor, I’m often the recipient of requests for financial help. I hear some heart breaking stories. The thing is, I’m sure that some of them are just that: well-crafted stories. And in that split second when I need to decide whether to give them money for gas or food or whatever it is they’re asking for, unless I feel a clear leading from God that something’s not right, I usually err on the side of compassion. I’m sure I’ve been taken by a good story on more than one occasion. But these are small dollar amounts. When someone comes in with a larger need, the church has a benevolence policy in place. It requires the approval of more than one person, a waiting period, and verification of the need. But often when we’re approached by scammers, especially online, they aren’t just looking for $20 to top off their gas tank or a few bucks to stock their pantry. They’re trying to convince people to part with hundreds or even thousands of dollars. They might start with a small request, but it quickly escalates after that. Sometimes the con artist is counting on our genuine (positive) desire to help others. Sometimes they’re playing on our equally genuine (negative) desire for financial gain. But either way, they’ll be wrapping it up in a package that is designed to manipulate our emotions and make us want to take the next step with them. Another point that I shared last week was about temptation. When we encounter temptation, it doesn’t look like danger and destruction. It looks good. It’s appealing. That’s why it’s tempting. And what’s appealing to one person may not have the same draw for another person. If you’re terrified of being on a boat, you’re probably not going to fall for a sales scam that offers a cheap cruise. But if you love cruises, you might be more inclined to check it out… and hope that it’s true! Your greatest desires, the things that you pray about or dream about, what you long for either openly or in secret - that’s where you’re most vulnerable. So what can you do to keep yourself from falling into a trap? First, AVOID MAKING BIG DECISIONS IN ISOLATION. Scammers often weave elements into their stories that are designed to encourage secrecy. They don’t want you to discuss their claims with anyone else because they realize that another set of eyes, another perspective on their story, will often cause it to unravel. Con artists also know how to recognize and take advantage of people who are isolated, who are less likely to have a support system around them. It’s important to note that there’s more than one way to be isolated. You can be isolated if you’re lonely. But you can also be isolated if you’re surrounded by people whom you call friends, but have no one in your life that you respect enough to take correction from. The best defense against falling for confidence games is being a part of a healthy community. Second, DON’T LET ANYONE RUSH YOU INTO A DECISION. Scammers love to use a sense of urgency (some kind of emergency or imminent deadline) in an attempt to force their victims to make a decision on the spot. Salesmen sometimes use this trick too - they know that if you take the time to think about a major purchase, you’ll probably decide against it. So often, the larger the purchase, the larger the incentive to sign up on the spot. In the scammer world, instead of giving you an incentive, they often threaten you with a loss if you don’t take immediate action. So take a step back and (again) get someone else that you trust involved for the sake of perspective. And finally, CHECK OUT THE STORY. Google the person’s name. Look for third party verification that the person is who they say they are - if all you find are social media profiles or personal pages/blogs that the person controls, that’s not very strong evidence. 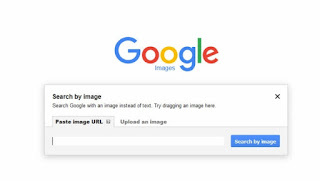 If they provide you with a picture, use Google’s reverse image search to see if it shows up in other places or associated with other names on the web. Also, type a one or two sentence summary of their story into a search engine and see if others have reported being told strikingly similar stories. Now if you’ve never fallen for a scam, don’t pull any muscles trying to pat yourself on the back :) None of us are perfect. Resist the urge to turn a judgmental eye on those who have been conned. These aren’t individuals who need to be shunned, they’re hurting people who need someone - someone genuine - to reach out to them. If you have fallen for a scam, you’re not alone. It’s not the end of the world. It’s an opportunity to learn where some of your weaknesses are and work on them. (And this is important, because unless you address the underlying weakness, you’re likely to see it crop up again elsewhere.) It’s also an opportunity to help others by sharing your story. These scams work because of the isolation factor - but when you share your story, you learn you’re not alone, and you help someone else who may be facing a similar situation. So… would you be willing to share a story of when you fell for a con (or maybe almost did)? Or have you ever been able to help someone in your life avoid, or recover from, a scam? Con artists are excellent at identifying and contacting vulnerable individuals. How can we, as the Body of Christ, do a better job of reaching out to those same people?